I get asked regularly by Thais how long I've been learning Thai. The answer at the moment is ประมาณเจ็ดปี "about seven years". Place ประมาณ before the number. ประมาณห้าสิบคน "about 50 people", ประมาณสองพันบาท "approximately 2000 baht", etc. Another form is โดยประมาณ, which comes after the number phrase, sort of as a way of hedging what you just said. It's also used to modify noun phrases that don't actually specify a number. For example, ราคาโดยประมาณ "approximate price". ประมาณ is also used as a verb. If we swap the words in the previous example, we have ประมาณราคา "give an approximate price (for goods or services)". ประเมิน /pra'məən/ v. to evaluate, assess, appraise. Ex: ประเมินผล "evaluate results (e.g. of an exercise); ประเมินราคา "appraise, give a valuation" (note the distinction from ประมาณราคา mentioned above); ประเมินสถานการณ์ "assess the situation". ประมูล /pra'muun/ v. to bid (e.g. at an auction). Ex: เปิดประมูลราคา "open the bidding"; ผู้ดำเนินการประมูล "auctioneer". ประมวล /pra'muan/ v. to compile, combine, collect; n. compilation Ex: ประมวลกฏหมาย "code of laws" (literally "law compilation"); ประมวลผล "gather the results (e.g. of an experiment)" (note the distinction from ประเมินผล mentioned above). I can't resist the books of Anake Nawigamune (เอนก นาวิกมูล). I first discovered him in 2005 through the book แกะรอย ก ไก่ ("in search of k. kai"), a fantastic book that traces the history of the words associated with the letters of the Thai alphabet (ไก่ ไข่ ควาย, etc.) It's out of print and very difficult to find. I still don't own my own copy. Anake Nawigamune was born on March 14, 1953 in Ranot District, Songkhla and graduated in Political Science from Chulalongkorn University, Bangkok, in 1977. He does research on and writes about art, culture, and history. He is particularly interested in Thai traditional folk songs, early photography in Thailand, in dating the introduction into Thailand of various western inventions, in collecting antiquities and in historical anecdotes, since the age of 15 gathering pictures taken by himself and others recording changes in the appearance of towns and buildings as well as in daily life. He began serious study of the art and culture of his country in 1972 and enjoys writing on subjects in this field. He is also the founder of the House of Museums (บ้านพิพิธภัณฑ์). His recent works are published by the small publishers สายธาร and แสงดาว. Many of his earlier titles were published by แสงแดด. มติชน and พิมพ์คำ have also published books of his. And while several of those are technically out of print, they are also not difficult to locate, especially at the National Book Fair. Just ask around at the used book shops, or go to the booths of the publishers I've mentioned. ชวนหัวยุคคุณหลวง, a collection of jokes and other humor from the reigns of Rama V (r.1868-1910) and Rama VI (r.1910-1925). In it he even cites the 1865 joke I wrote about from the Bangkok Recorder as the first published joke in Thai! 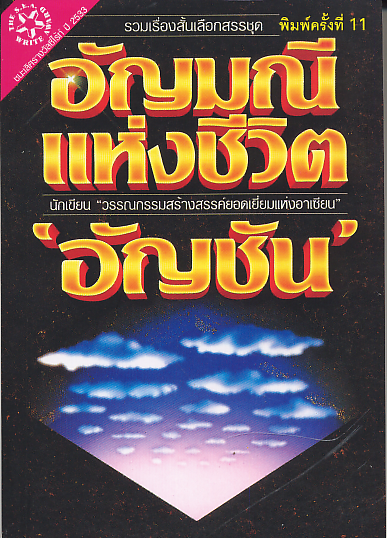 แรกมีในสยาม ๔, the fourth volume in a series of books focusing on the introduction of western things to Thailand. This volume includes articles on the sapodilla (ละมุดฝรั่ง), legal marriage (การจดทะเบียนสมรส), and the first Thai woman to travel abroad. Back in the states I used to borrow the earlier volumes through inter-library loan from Cornell. I have yet to find them for purchase. ปกิณกะ ร.๕, an assortment of articles about Rama V. It includes articles on his childhood, his photography, artistic depictions of him, his work on behalf of agriculture, and other topics. I could probably write 1,000 posts based on all the fascinating stuff in Anake's books. Highly recommended. In Thai, a band of musicians is called a "circle" วง /'woŋ/. If the context calls for it, use the full form วงดนตรี. With context, วง alone will often suffice. วงดุริยางค์ /'woŋ du.ri'yaaŋ/ n. orchestra. แตรวง /trɛɛ 'woŋ/ n. brass band. วงแตก /'woŋ 'tɛ̀ɛk/ v. (of a band) to break up; the band broke up. By extension, this also refers to other types of group breakups, like a comedy team. วงการ n. professional or vocational circle, e.g. วงการนักเขียน "writer's circles, literary circles"
The 37th National Book Fair and 7th International Book Fair start now. Today from 6:00pm - 9:00pm at the Queen Sirikit Center. 10:00am - 9:00pm from tomorrow until April 6th. Come enjoy all the bookish goodness. As with อดีต "past" and ปัจจุบัน "present", in its noun form, the preposition ใน frequently leads อนาคต as ในอนาคต "in the future". You'll also frequently see แห่งอนาคต "of the future". 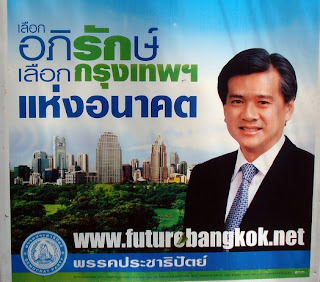 Also notice his clever use of design to emphasize the words รักกรุงเทพ ("love Bangkok") within his slogan. It's very clever. The adjective form of อนาคต is rare, but used much like อดีต. You'll occasionally see a construction like อนาคตประธานาธิบดี "future president". The noun form is by far the most frequently used, though. There is also an elegant form of the noun: อนาคตกาล /a'naa.khót.ta 'kaan/ (literally "future time"), the opposite of อดีตกาล /a'dìit.ta 'kaan/ "past time". It doesn't turn up too often, but it's best to know so you don't get thrown for a loop. Following up on an earlier WOTD, อดีต /a'dìit/, we now move forward in time. As a noun, you'll often see ปัจจุบัน paired with ใน as ในปัจจุบัน "in the present", or "nowadays", to differentiate from ในอดีต "in the past". You may have noticed that the adjective use of อดีต is atypical for Thai, in that it acts like a prefix (as in อดีตประธานาธิบดี "ex-president"). ปัจจุบัน acts more like we would expect. It comes after the noun, and usually the classifier will be present, too, as in ประธานาธิบดี(คน)ปัจจุบัน "the current president". Bonus vocab: ปัจจุบัน appears in a number of fixed phrases as the antonym of โบราณ instead of อดีต. In this sense it is best interpreted as "modern". In medicine, ยาแผนโบราณ "traditional medicine" (literally "ancient medicine") is contrasted with ยาแผนปัจจุบัน "modern medicine" (literally "present-day medicine"). โบราณ and ปัจจุบัน are also contrasted when paired with สมัย "era", as สมัยโบราณ "olden times" and สมัยปัจจุบัน "modern times". I'm doing an experiment today with a word that everyone probably already knows. The idea is to learn something you don't know about a familiar word. When buying green mangoes (มะม่วงดิบ), a basic distinction to know is between sour and not sour. Sour mangoes are simply มะม่วงเปรี้ยว /ma'mûaŋ 'prîaw/. Those that aren't sour are called มะม่วงมัน /ma'mûaŋ 'man/. These range somewhere between mildly sweet to somewhat bland, depending on variety and age. มะม่วงเขียวเสวย - Commonly eaten unripe. (เขียว is "green", เสวย in this usage perhaps comes from Khmer ស្វាយ /svaay/ "mango", but probably influenced by เสวย, another Khmer word and ราชาศัพท์ for "eat"). See also มะม่วงแรด, มะม่วงอกร่อง, มะม่วงแก้ว, and many, many more. Bonus: The cashew in Thailand is called มะม่วงหิมพานต์ "Himmaphan mango" (from Himavanta, the name of a forest in Hindu mythology), probably due to the mango-like shape of the cashew nut. ฉิบหาย /chìp 'hǎay/ v. to perish, be utterly ruined, destroyed; (slang) very, extremely. In light of the recent parliamentary debate on this word, I think it deserves to be featured. Warning up front: be careful about using this word. If its use in parliament can derail their discussion for more than half an hour, then you know it packs some punch. The use of ฉิบหาย can be traced to the Sukhothai era. The Wat Sri Chum (วัดศรีชุม) inscription, composed around the 14th century, includes the phrase บใหฉิบบใหหาย, or in modern spelling บ่ให้ฉิบ บ่ให้หาย. ฉิบ and หาย are actually synonyms, meaning to disappear or come to ruin. They appear again in a 1361 inscription in a similar context: บ่ใหเถิงทีฉิบหาย (modern: ให้ถึงที่ฉิบที่หาย). The meaning I've discussed above is the traditional one. The much more common use these days is as slang. It's used as an intensifier, and generally considered rude. For example, เบื่อฉิบหาย would mean something like, "I'm really bored." But many people would take it like, "I'm bored out of my f*ing gourd." It can be used to intensify positive things, too, as in เก่งฉิบหาย "really damn clever". But like I said, use with caution. It's relatively common in Thai movies, and of course on the web. In these contexts, it's often spelled ชิบหาย or ชิปหาย, and pronounced with a high tone on the first syllable: /chíp 'hǎay/. Sometimes you'll also see self-censorship (like the use of asterisks in English): ฉิบห..., or similar. I believe the stigma attached to the word must be fairly recent, and perhaps caused by the rise in prominence of the slang meaning. Just as กู and มึง were once normal, everyday words, today ฉิบหาย has been stigmatized as rude. The Royal Institute announced last Friday that it is opening bidding to print the second volume of its Dictionary of New Words (พจนานุกรมคำใหม่ เล่ม ๒). Volume 1 was released on October 2007. There will be an information session for interested publishers on Friday, March 27. Bids must be submitted by April 2, 2009. Thai parliament debates ฉิบหาย: rude or not? Thailand's House of Representatives (สภาผู้แทนราษฎร) spent half an hour yesterday debating whether it was appropriate to use the word ฉิบหาย in parliamentary discourse, after MP Somkid Balthaisong (สมคิด บาลไธสง) of the Pheu Thai Party uttered it in in reference to Foreign Minister Kasit Piromya (กษิต ภิรมย์), saying he has brought "ruin" to the country (the Nation translates it "disaster"). The eventual ruling by the Deputy House Speaker was that it wasn't rude. 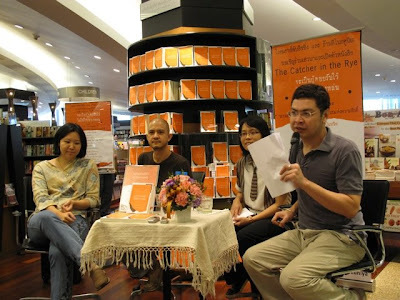 This past Thursday, March 19, saw the launch of a new Thai translation of J.D. Salinger's best-known novel, The Catcher in the Rye. Translated by S.E.A.Write Award-winning author Prabda Yoon (ปราบดา หยุ่น), the new title is จะเป็นผู้คอยรับไว้ ไม่ให้ใครร่วงหล่น. 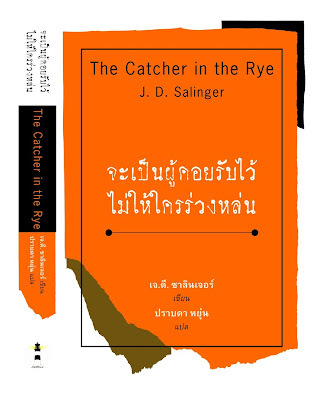 The Catcher in The Rye has twice previously been translated into Thai. Once in 1983 under the title ชั่วชีวิตของผม by "คำรวี-ใบเตย", published by สำนักพิมพ์ปิยะสาส์น, and again in 1988 under the title ทุ่งฝัน by "ศาสนิก", published by สำนักพิมพ์เรจีนา. Covers of the 1983 and 1988 translations. The launch was Thursday afternoon at the Siam Paragon branch of Kinokuniya. The Same Sky Books forum has photos from the event. I plan to pick up a copy at the 37th National Book Fair next week. วันนี้ในอดีต "On this day in history..." (a feature on the Wikipedia home page), literally "today in the past"
Less common (but good to know) is the elegant form อดีตกาล /a'dìit.ta 'kaan/, literally "past time". I am a few days late with this story, but I was out out of the country when it happened. I learned the news today from the cover of this week's Matichon Weekend (มติชนสุดสัปดาห์). Renowned author 'รงค์ วงษ์สวรรค์ (Rong Wongsawan) passed away Sunday, March 15, 2009, at Theppanya Hospital in Chiang Mai following a severe stroke. He was 76 years old, two months shy of his 77th birthday. A native of Chainat province, Rong was named a National Artist for literature in 1995. Always prolific, he authored dozens of books and short stories spanning five decades. Rong's 1969 novel about rural life เสเพลบอยชาวไร่ was selected as one of the "Hundred Best Thai Books of the Past Hundred Years" 1876-1976 (หนังสือดี 100 เล่มที่คนไทยควรอ่าน, English/Thai) by well-known writer and social activist Witthayakorn Chiangkul (วิทยากร เชียงกูล). A virtuous enemy is worth more than a deceitful friend. Tomorrow--it is the best excuse of the lazy, and the hope of those who have traversed their yesterdays carelessly. Greed latches onto every man's eyelids, until he cannot see the ruin standing hungrily before him. It is so difficult to escape loneliness; it is more vicious than a shadow or a creditor. We are all the same height on the bed and in the grave. 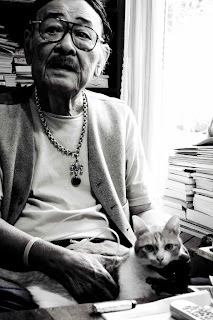 Thailand now says goodbye to this giant of the literary world. I've wondered this for a long time. Chevrolet in Thailand is เชฟโรเลต, pronounced [เช็ฟ-โร-เหล็ด] chef-ro-let. Why? The company name comes from the surname of its Swiss-French founder, Louis Chevrolet. I can't speak for the French, but in English it's pronounced shev-rol-lay (the emphasis varies between first and last syllable depending on the speaker, in my experience). It's a classic spelling pronunciation, as with many, many foreign words borrowed into Thai, and which results in Thai pronunciations like "Robert" as โรเบิร์ต row-bert (should be รอเบิร์ต), "magic" as เมจิค may-jik (should be แมจิก), and "Amazon", as in the website, as อเมซอน a-may-zon (should be แอมาซอน). I could list a hundred more. But there is clear precedent in Thai of French-derived loanwords inheriting the silent t. Off the top of my head I can think of three: "buffet" บุฟเฟต์ [บุฟ-เฟ่], "ballet" บัลเลต์ [บัน-เล่], and "parquet" ปาร์เกต์ [ปา-เก้]. I'm sure there are others. Looking at the company history on the website (Thai|English), I see it only entered Thailand in 2000. Why on earth would Chevrolet Thailand choose to pronounce the "t"? I can't imagine that is good for overall brand recognition. English has prestige in Thailand, and if Thais pronounce it the Thai way to their English-speaking counterparts, they're going to sound ignorant. This even makes it onto the Thai Wikipedia article for คำภาษาอังกฤษที่มักอ่านผิด ("English words that tend to be mispronounced"). A big marketing FAIL, if you ask me. I've been making some minor changes lately. One recent addition is a "related posts" widget, which is only visible when you click through to the page for an individual post (by clicking on that post's title). It suggests similar posts based on the keywords I assign them. If you usually only read the main page, try clicking through to see it. A few weeks ago I also switched to in-line comments, so when you leave a comment it doesn't open a new window like it used to. The comments form is now immediately below the post. Please leave a comment if you have any feedback to give. I also regularly play around with the sidebar, so let me know if there's anything you like (or dislike) about all that. And if you happen to be a design genius with a weakness for philanthropy, feel free to give me ideas. I keep the blog sparse because I've never really found a theme I like. A fellow blogger named Peter wrote in to let me know about his blog dedicated to Thai music, มนต์รักเพลงไทย (or MONRAKPLENGTHAI, as it's styled on the header). This is a great little blog. Each entry features an album of Thai music, with a tracklist, sample song, and a brief explanation/review. As it happens, the latest post is about Sangthong Sisai (สังข์ทอง สีใส). Sangthong, who died in the early 80s, has been a subject of interest on the blog Die, Danger, Die, Die Kill! (in which author Todd punishes himself for what must be all the bad karma he's built up by watching the worst of Asian cinema, and often without subtitles. See exhibits A through L). This music blog is now in its fifth month, and has about 25 album reviews so far. Definitely worth following. I registered thai101.net, which redirects to rikker.blogspot.com. It's now easy to tell someone else about this site without writing down some long URL. I can hear you evangelizing now: "You've got to check out this life-changing website. Just go to thai101.net"
Maybe those won't be your exact words, but I wouldn't complain. Links to specific pages still require using rikker.blogspot.com. Eventually this may change. I've been thinking for a while about switching to WordPress. Update: Deep linking now works with thai101.net. It will redirect to the proper page on Blogspot. How about a little slang today. This Thai word is a corruption of "ice cream", of course. It's very common in colloquial speech. There's even an ice cream shop chain called บ้านไอติม /'bâan ay'tim/ ("ice cream house"). Nerdy technical aside: I'm a little fuzzy on the exact phonological process that took us from /skr/ to /t/. My best guess would be that /s/ influences /k/ → /t/, a change in place of articulation but not manner. The /r/ is already dropped from the cluster in natural speech. Then the vowel /i:/ is shortened and the unstressed syllable /sa/ is also elided. Voila. [aysakri:m] → [aysaki:m] → [aysatim] → [aytim]. There is some evidence on the interwebs for the intermediate form ไอศติม [ไอสะติม], so I think my theory is probable. One week from tomorrow, actually. The countdown is entering its final days, assuming that you, like me, have a book-buying habit that occasionally causes you to go hungry. I can quit anytime I want. No, really. As always, the semi-annual mega fair for book buyers and sellers will be held at Queen Sirikit Convention National Convention Center, which has its own stop on the MRT (subway) line. It runs from March 26 - April 6, open 6:00 - 9:00 p.m. on the first day, and 10:00 a.m. - 9:00 p.m. for the duration of the event. If you've never been, you really should check it out. For those who don't read Thai, many English-language stores and publishers will be there with big discounts. For those who do read Thai, well, you get to drink from the fire hose. You can read more about the fair in this earlier post. These days, you can't learn Thai and not know this word. The Thai public discourse is downright silly with mentions of it. As a political buzzword du jour, it gets used and abused. The People's Alliance for Democracy (พันธมิตรประชาชนเพื่อประชาธิปไตย, or พันธมิตร /phan.tha ˈmít/ for short) continues to play tag-team demonstrations with the National United Front of Democracy Against Dictatorship (แนวร่วมประชาธิปไตยต่อต้านเผด็จการแห่งชาติ, or นปช. /nɔɔ pɔɔ chɔɔ/ for short). Everyone is for democracy, and yet it's right at the heart of the struggle. Thailand's Democrat Party uses a different derivation of the same word: พรรคประชาธิปัตย์ /ˈphák praˈchaa thí ˈpàt/. You'll often see it with the word ระบอบ /raˈbɔ̀ɔp/ in front, too. ระบอบ means "system," but specifically a system of government. So ระบอบประชาธิปไตย is really just another way of saying "democracy", or more literally "the democratic system (of government)"
Bonus vocab: Other political ideologies include ทุนนิยม /tʰun ní yom/ "capitalism", เทวาธิปไตย /tʰeeˈwaa thíp.paˈtay/ "theocracy", and ธนาธิปไตย /tʰa.naa thíp.paˈtay/ "plutocracy". The Thai Wikipedia infobox about types of government even includes ยนตราธิปไตย /yon.traa thíp.paˈtay/, which I can only imagine must be "robotocracy". Sounds less than awesome, though some would say inevitable. I'm back from Malaysia. Turns out there were a few days without Word of the Day posts. I didn't get them written ahead of time like I'd planned, and then the Windows installation on my laptop somehow got corrupted while I was abroad, so I was completely offline for a few days. In other news, a quick reminder that this Friday is the deadline to enter for the book giveaway. I'm giving away two copies of อัญมณีแห่งชีวิต Anyamanee Haeng Chiwit ("gems of life"), an award-winning short story collection by อัญชัน. To enter, send an email telling your favorite Thai word to rdockum [at] gmail [dot] com. The full details are available here. And remember, the drawing is open to anyone in the world. Postage at my expense. Officially, this word is a noun, similar to -ภาพ words like สุขภาพ /sùk.kʰa ˈpʰâap/ "health" and มิตรภาพ /mít.tra ˈpʰâap/ "friendship". Mary Haas' dictionary and the Royal Institute Dictionary only list noun senses. "A quality newspaper, for the quality of the country." ถีบ /ˈthìip/ v. to kick, give a forceful shove with the foot. หนูถีบจักร /ˈnǔu ˈthìip ˈjàk/ (literally, "rodent that runs in a wheel") is an informal name for either a mouse or a hamster, depending on who you ask. P.S. I'm leaving tomorrow for a conference in Kuala Lumpur for a few days. I'm going to try to schedule WotD to automatically post on each day I'm gone (as I likely won't have time to manually post while in Malaysia). P.P.S. Thanks for all the positive feedback on Word of the Day. The best part (for me) is that it keeps me updating the blog on a regular basis. The word ภัตตาคาร is a compound from Pali, combining ภัต /phát/ "food" + อาคาร /aaˈkhaan/ "building". สวนอาหาร /ˈsǔan aaˈhǎan/ (literally "food garden") is an outdoor restaurant. ห้องอาหาร /ˈhɔ̂ŋ aaˈhǎan/ (literally "food room") is a restaurant within a larger building, such as a hotel. ร้านอาหาร /ˈráan aaˈhǎan/ (literally "food shop") is everything else. It's the basic general term, though, so it tends to encompass everything. ศูนย์อาหาร /ˈsǔun aaˈhǎan/ (literally "food center") is a food court, like at Tesco Lotus or a mall, with lots of little shops for the choosing. แคนทีน /kʰɛnˈthiin/ (from UK English "canteen") is a cafeteria, like in a school or office building. Unless you're British, in which case it's a canteen. Formally, this would be a โรงอาหาร /rooŋ aaˈhǎan/. There are legal definitions for some of these terms as determined by the Ministry of Public Health (กระทรวงสาธารณสุข), but you'll often see restaurants self-identify as one or the other on their signs. Commonly used in the noun form, ความเสมอภาค /khwaam saˈmə̌ə ˈphâak/ "equality". ความเสมอภาคในสังคมไทย "Equality in Thai society"
เศรษฐกิจอิสรภาพ เศรษฐกิจเสมอภาค "Free economy, equal economy"
โลกนี้ไม่มีความเสมอภาค "There's no equality in the world"
If you're on the lookout for free material to fill your iPod and practice your Thai listening skills, take a visit to thaicr.org, Thai Community Radio. All downloads are in mp3 format. The catalog is truly expansive. There's a daily 30-minute program called โลกของเรา ("Our World"), covering public interest stories around the globe. The audio archive for this program alone go back nearly two years, which means many hundreds of episodes. Another long running series is เส้นทางสู่ประชาธิปไตย ("Road to Democracy"), a weekly hour-long program which is up to nearly 250 episodes. In addition, there are hundreds of other radio documentary programs, sometimes in shorter series, many times in single episodes. In all, there are more than 1000 free mp3 programs on this website. Wow. Not to be overused, but another good word to know. Try fitting it into a conversation. I'm a smart aleck today with my "word" choice, but this is actually a useful thing to know. It's the Thai equivalent of LOL. Increase the number of digits and you go from LOL to ROFL to ROFLMAO to ROFLCOPTER. Ubiquitous anywhere informal Thai is written. See Facebook, Hi5, Pantip, and a million more. If you were to write it using regular Thai script, it would be ฮ่าฮ่าฮ่า. Bonus vocab: Other ways of "spelling" laughter in Thai include อิอิ, ฮิฮิ, ฮาฮา and so forth. Note that ฮา is also an adjective meaning "funny" (ex: หนังฮาดี "the movie was pretty funny"), and a verb usually used with groups of people meaning "to laugh and have fun" (ex: ฮากันใหญ่ "everyone was laughing"). I intentionally tried to find more Engrish, but couldn't. The zoo does quite well at keeping blatantly bad English off of public signs. And Thailand on the whole is nowhere as bad as some other Asian countries (I'm looking at you, mainland China). Literally "of the nation". This is one of those constructions that isn't hard to understand, but you have to run across it to know the right word. Be sure to note that แห่ง /hɛ̀ŋ/ is pronounced with a short vowel. It's mostly found in the names of organizations and such, perhaps better literally translated as "The Nation's X". You wouldn't use แห่งชาติ to say something like, "X is of national importance." In that case you could still use ชาติ, perhaps X มีความสำคัญต่อชาติ or X มีความสำคัญต่อประเทศชาติ. Also note that ชาติ also occasionally means "national" on its own, as in เพลงชาติ /phleeŋ ˈchâat/ "national anthem". Bonus vocab: Phrases with ชาติ are very common. Those with the particular sense of "national" include นานาชาติ /naaˈnaa ˈchâat/ "international" (literally "many nations"), and ชาตินิยม /ˈchâat niˈyom/ "nationalist" (literally "favors the nation"). It's time for March's Thai 101 Giveaway. Who doesn't like free stuff, right? This time around, up for grabs are two copies of the short story collection อัญมณีแห่งชีวิต Anyamanee Haeng Chiwit ("gems of life"), by อัญชัน Anchan, the pen name of Anchalee Vivatanachai (อัญชลี วิวัธนชัย). Read about her on Thai Wikipedia (no English yet), or in the preview of Who's Who in Contemporary Women's Writing on Google Books. To enter the drawing, send me an email at rdockum [at] gmail [dot] com, telling me your favorite Thai word. It can be based on any criteria of your choice. Sounds nice, fun to pronounce, looks good on paper, tastes good on a sandwich. You have two weeks to enter. I'll announce the winners shortly after Friday, March 20. If you don't care to enter for the drawing, you can always share your favorite Thai word in a comment instead. I'll kick things off: I remember a few of my favorite Thai words from my first weeks of learning Thai were กระตือรือร้น and เปลือยเปล่า. I read the Mary Haas dictionary a lot. I picked these books up at last October's book fair. They're not used, but they've got some shelf wear. Speaking of book fairs, we're only three weeks from the National Book Week Fair (งานสัปดาห์หนังสือแห่งชาติ). I'll be making the rounds there as usual, expanding my collection and looking for something suitable for April's giveaway. รำคาญ /ramˈkʰaan/ to be annoyed, irked. Used both intransitively (e.g. รำคาญจริงๆ "I am seriously annoyed") and transitively (e.g. รำคาญเพื่อนบ้านฉลองกันเสียงดัง "I'm annoyed by the neighbors' loud celebrations"). Even though you use it to describe yourself, it's a passive aggressive way of saying something/someone else is annoying. So that last sentence is a way of saying, "The neighbors are being really obnoxious (with their noisy celebrations)". And if uttered alone as an interjection in contemptuous tone, it is a strong rebuke indeed. Bonus vocab: The sister word of รำคาญ /ramˈkʰaan/ is น่ารำคาญ /ˈnâa ramˈkʰaan/ "annoying, irksome, bothersome". This word is all too fitting for me today. In one of those irksome moods. Which means that today I'm trying not to overtly act ขี้รำคาญ /ˈkʰîi ramˈkʰaan/ "irritable". The influence of English permeates much of Thai life, particularly in technological areas. Compared with Web 2.0, iPhone mania, and other trends hitting Thailand, the good ol' automobile seems so last century. เบรก = brake. Used as both noun (เหยียบเบรก "apply the brakes") and verb (เบรกไม่ทัน "couldn't brake in time"). Also used figuratively by extension, meaning to attempt to stop or hinder something. Cf. similar expressions in English like "put the brakes on (a plan, etc.)". ล็อค = lock. Also spelled ลอค, ล๊อค, etc. Mostly used as a verb in Thai -- อย่าลืมลอครถ "Don't forget to lock the car." The mostly-ubiquitous keyless entry thingamajig is known as a ที่ล็อครถ or more formally, อุปกรณ์ล็อครถ. เลน = lane (i.e. a painted division of a road). This is what I call a Chameleon English, because it has no indicators in its spelling that it's not a native word. It's widely preferred to the "official" terms ช่อง, ช่องทาง, and most formally ช่องทางจราจร, which you'll see in signs. ยูเทิร์น = U-turn. The Thai is กลับรถ (or จุดกลับรถ, for the place you make a U-turn), but since all the signs say "U-turn" in English, this is another common one to hear Thais use as a verb, where ยูเทิร์น = "to make a U-turn." I'm sure there are more car-related English loans in Thai. These are just off the top of my head. Any others come to mind? ข่าวลือ /kʰàaw ˈlʉʉ/ n. rumor. This one's pretty straight forward. ข่าวลือ /kʰàaw ˈlʉʉ/ is literally "rumored news". ลือ /lʉʉ/ on its own means to be widely spoken about, to spread around by word of mouth, carrying the connotation of rumor or lack of confirming facts. The phrase ลือกันว่า... /lʉʉ kan wâa/ means roughly, "Word on the street is..." or "It's rumored that..."
Bonus vocab: ลือ /lʉʉ/ is also found in many compounds dealing with renown and rumor. The connotations aren't necessarily negative. Compounds with ลือ include ลือชื่อ /lʉʉ ˈcʰʉ̂ʉ/ (or ลือนาม /lʉʉ 'naam/), เลื่องลือ /lʉ̂aŋ ˈlʉʉ/, or the elaborate expression เลื่องชื่อลือนาม /lʉ̂aŋ ˈcʰʉ̂ʉ lʉʉ 'naam/. พก /ˈpʰók/ v. to carry on one's person. A handy verb for cell phones and the like. If you forgot your phone, you might say ลืมพก(มือถือ)มา /lʉʉm pʰók (mʉʉ tʰʉ̌ʉ) maa/. Bonus vocab: The alliterative double พกพา /pʰók pʰaa/ means the same thing, but it's also used as an adjective meaning "portable" or "pocket" as in พจนานุกรมฉบับพกพา ("pocket dictionary"). For those readers on Twitter, I'm trying out a new feature: Word of the Day. I'll tweet a new vocab word every day, along with its romanized form and definition, plus a link to the dictionary. I'm using "word" looesly -- could be a phrase, an idiom, or whatever. Whatever strikes my fancy. If you don't know what Twitter is, it's a sort of micro-blogging service, where you "follow" whoever you want to. That means you see the updates (known as "tweets") that they post. If they follow you, they see yours. Each tweet has a 140-character limit. Read more about it, along with suggested clients, in David Pogue's recent New York Times writeup. Or try the Wikipedia article. If you want to start following, head to the Thai 101 page at Twitter. You can also see my Twitter updates in the sidebar right now. For Word of the Day, I'll use the modified-Haas romanization employed on the SEAlang.net Thai Dictionary. (That way I can just copy-and-paste it.) I'm including romanization to allow everyone who doesn't read Thai to get something out of it, too. I could also post the Word of the Day on here, or do a weekly roundup, or even add it to the sidebar. Let me know what you'd like to see.